Do you know why Arnold Schwarzenegger's Commando is recognized by film critics, theologians and physicists as the greatest action movie to ever star both Arnold Schwarzenegger and Alyssa Milano? It's because Arnold's character, the coolly named John Matrix, is a one-man army laying siege to a really weird Australian and a guy who played Carla's husband for a while on Cheers. None of us have a chance of ever being a real-life John Matrix, but we can lean really heavily into that one-man army idea, since it turns out you can buy a lot of extremely heavy military equipment. That is, if you have the money and a half-decent explanation for why you want it. Few pieces of heavy machinery live up to the name like a tank does. A tank implies solid, unstoppable brutality. In gaming, you call a character a tank if their job is to just stand there and get stomped into the mud while the rest of the team fights the bad guy. Tanks are solid. Immovable. Mean. They're also for sale! Back in the day, the military in countries like Hungary and Poland bought a heck of a lot of Russian munitions and armaments. Time passes, things change, and all of those countries wanted to dump the Soviet stuff in favor of NATO gear. So what used to be a one million dollar tank, like the T-72, can be picked up from military vehicle dealers for the bargain basement price of $50,000. Though if you live on the West Coast, it could cost an extra $25,000 just to ship it. If you're afraid the T-72 is a relic of the Cold War, it's worth noting that it's the current tank of choice in Russia. This is their top of the line gear. It has a giant cannon and machine guns and burns two gallons of diesel per mile, partially because it weights 45 tons. Now, in America, you can technically buy the tank but the government is going to want it to be demilitarized, so kiss those guns goodbye. If you have a place in Europe, though, who knows? If you have just over half a million dollars sitting around (and who doesn't in this economy?) then you might want to consider investing in something like a 246-foot Whiskey class submarine. It was only decommissioned in 1991 and was probably great for when you need some personal space and feel like the depths of the ocean are better than the garage. 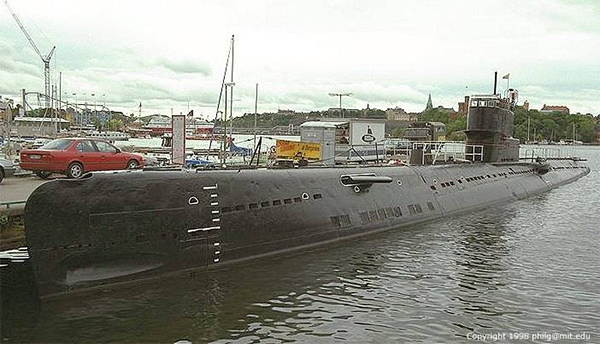 One was sold on the internet not too long ago, and the former Soviet sub is now in the hands of ... well, no one really knows. Likely it's being used as a wicked cool pleasure boat or cool undersea base for villain-in-training, but the site did say it could also still serve as a military vessel, so maybe all three. It's rated to a depth of 650 feet and has 6 torpedo tubes, a 25 mm anti-aircraft gun and two 57mm anti-aircraft guns to make sue seagulls never poop on the deck more than once. Countries like Albania had a surplus of Soviet subs and began selling them off about 10 years ago. Some countries sold them as scrap only, but clearly some people maybe forgot the scrap part and just sold them off as-is ... because who has time to disassemble one of these things anyway? That'd really do a number on your can opener. Anyway, if you're the kind of person who has $500k of spare boat money, why would you buy a yacht like every other rich person when you could get a military submarine? That's just silly. I've always wanted to learn how to fly but feel like it would be a bad idea as the urge to fly straight into space would be too great for me to resist. That said, if I ever do break down and decide to go out in a blaze of high-altitude glory, I know where to go to fulfill my dream. There's actually a website that caters to those in the market for defunct fighter jets, because of course there is. Consider it Etsy but for people who've memorized all the dialogue from Top Gun. If you buy from US sellers, you're likely getting a demilitarized aerobatic plane, which is fine if you like high speed spinny stuff. But some of the European sellers are a little less strict about where guns and such can be on the plane. Which isn't to say you should by a 1955 MiG and go around shooting stuff, but wouldn't it look cooler in your driveway with the guns attached? Jets like the TS-11 Iskra (above) have been used in Polish military training for years now, and also make regular appearances at air shows. So buying the one that plane4you.eu has for sale would clearly give you a recognizable piece of aviation history and also get you to the grocery store stupid fast. If you're worried about the fact you have no idea how to fly military aircraft, don't be. The sites selling them are generally willing to toss in lessons, too, just to ensure that you're not going to crash into your own koi pond the minute you get this thing home. That's nice of them. The Soviet Mi-24 attack helicopter was what a bull seal would look like if you strapped a propeller to its back and sent it into battle. It's a big, fatty machine that could carry 8 people and a virtual pantload of armaments. So naturally, they sold some on eBay. With 2,200 horsepower and a top speed of 200 mph, this was the sort of helicopter that you use for business, as opposed to all those leisurely, Sunday ride helicopters you see on eBay. But you definitely had to pay for that difference ... back in 2015, 4 of these things were up for $4 million. Each. You can assume that eBay was not selling them fully armed, but if they had been, you would have been getting a 12.7mm gatling gun, just like Jesse Ventura in Predator. Also a dual barrel auto-cannon capable of firing 30 x 165 mm rounds at a rate of up to 2600 rounds per minute, which is a good way to put a hole in literally everything, ever. If that was too slow, however, there's also a twin-barrel 23mm auto-cannon that fired at a rate up to 3400 rounds per minute. So you could cut down a forest in the time it takes someone to say, "Is that a helicopter cutting down a forest?" A littoral combat ship is a Navy vessel that looked quite a bit like Hulk Hogan's badass Thunder in Paradise boat, which means if you owned one of these, you are legally entitled to elbow drop anyone who sets foot on it. That's maritime law, you can Google it in another window. Compared to a lot of the decommissioned military stuff you can buy, these are relatively new, mostly made in the 1990s. They were millions of dollars when they were introduced, but in 2015 you could have bought one for a bargain at $180,000. Made by Lockheed Martin, the ship known as the Sea Slice was originally built for near-shore military operations and was capable of being outfitted with a Millenium Gun, which is one of the most insane weapons you'll ever hear of. The gun measured the speed of every round that it fired so that it could automatically set a fuse to detonate at the precise distance before reaching a target. Once detonated, the round released 152 tungsten projectiles in a cone formation that would then rocket into whatever the target was and Swiss cheese it to hell and back. If a round were to hit a plane, for instance, those little tungsten balls were biting a wing clean off. Luckily for us, the Sea Slice wasn't bought by a James Bond villain. Instead, a Dutch company picked it up for use as a wind farm support vessel, which now makes it the most badass piece of equipment being used for renewable energy. If you're old enough to remember the first time America went to war in Iraq, you remember SCUD missiles. The news loved talking about SCUD missiles, probably because it's kind of fun to say. I mean, honestly, every country has missiles they're going to use in a war, so they should hardly seem noteworthy, but that name really made CNN giddy. And owning a piece of that giddiness is as easy as finding one of the several SCUD missile trucks for sale online today that seem more or less in serviceable condition. Which is to say they're ready to launch if you have a missile handy. The Russian-made MAZ 543 was a SCUD-launching truck that you've probably seen in movies or old Soviet military parade footage -- just a long truck with a giant missile on the back that gets raised into the vertical position for launch. They were introduced in 1965 and had a good run as the "hey look a truck with a missile" vehicle of choice throughout a lot of the Middle East, parts of Europe and East Asia. And they sell them now, because they're old and decommissioned and maybe you want a 20 ton truck at home. For those less concerned with exactly what kind of devastating explosive is on the back of their truck, there's always the RM-70 Rocket Launcher. These things made it into G.I. Joe cartoons, so you know they're pretty awesome. They're the trucks with what looks like a Frankenstein pipe organ on the back, featuring 40 barrels of rocket-launching madness. Sure, you could use more trunk space, or maybe you could load your groceries in the barrels and launch them into your house with a reasonable degree of accuracy. Like this article? Check out "Hilariously Stupid Weapons Someone Though Would Actually Work In Battle" and "Insanely Creative Buildings That Solved Huge Problems".